Dear Virginia, I miss seeing you but enjoy your letters so I can keep up with you. 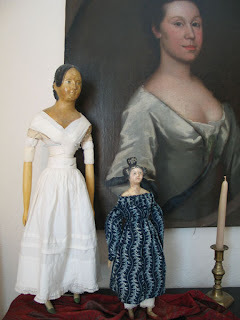 Mostly I am sewing on doll bodies and doll clothes. I like to have a nice display of the dolls and old toys at Christmas and this year I will be able to again. This week I am mending on a fragment of a beautiful old log cabbin quilt to hang in the back of one of my doll cases. My doll collector friend JoAnne came by yesterday for the first time in several weeks, she can see I have been working on the dolls and decorating their cases. Breaking one this week really reinforced the need to have more of them behind glass. And of course dusting them is a problem when there are so many out loose running around the house. There is a hint of fall now. The purple lab lab bean, Mr Jefferson's vine is blooming. Our back yard is small, but I enjoy it hugely! I have a fall wreath on the front door and an arrangement in the dining room and some pumpkins here and there. Barb Carroll and Julie Marie Smith and a few more rug hookers are coming to see us this weekend, I will have pumpkin bread and Choc sheath cake made. Our Grandson Tyler loves my baking!! We are enjoying him so much. He is studying Lord of the Flies. I had missed that so am learning of it too! I suspect that having him around is going to be like another ticket through life!! Catch the brass ring and go around again! The best one still just breaks my heart, a 24 inch coifure doll with the high three part hair do, that was complete and perfect with original clothing, and everything perfect, brown eyed 1830 doll. In the terrible first 24 hours after the fire, when we were dealing with 50 people and hundreds of decisions, and I was in complete shock, We cut away and threw away the soaking leather body and darkened clothes to give the soaking wet head a chance to dry, which it did although much gesso was lost. We saved 26 sodden warping peeling charred papier mache heads that way. I have all of her parts, terribly darkened but she still looks at me from sad little eyes. I am still thinking what to do about her, I may make a new body and attach her wooden legs and arms and mount the head with out repainting at all, just see how that does, at least it shows what she was, and she is not charred, just smoked. I have left her till almost last of the restorations from the fire, I think to do the least is the way to go. Does anyione like these wig heads? They are cousins to the papier mache dolls. These two are some I used to have, which I had repainted. I put nice early fabric at the necks. 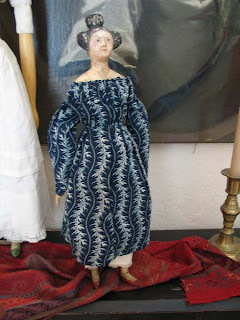 Two more similar ones are in my closet I look forward to having some fun painting and "dressing" them. The Star of Texas Rug Hooking camp is starting next week, Barb and Julie Marie and a few more are in and out of our house a number of times during the week so it will be a happy busy time! No doll work next week!! I think I will put this one back together today. She has an interesting all wood torso and head, no the head does not have details pressed of gesso or composition it is carved wood through out. 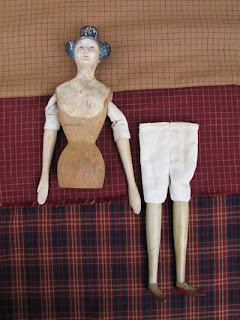 There is a hole ( original) through the shoulder part, where we have used a cloth tube to hold the wooden arms Jack made and I made cloth pantaletts to gather around the doll's waist to hold the wooden legs he carved. I believe the head with torso to be German and date about 1835. She was smoke and fire damaged in our house fire. There will be a hookin tomorrow at the hanger here in Fredericksburg, I will see so many ruggers there, always over 100 attend and bring rugs and hook and eat together and enjoy exhibits and vendors. I miss my rug hooking friends. I am not hooking these days, but of course always have a couple of works in progess sitting in a basket waiting. I hope to make again some of the hooked pieces we lost in the fire. I have devoted most of my craft time to working on the dolls, and yesterday got fabric backings in the big glass cases I keep many of them in. We cut styrofoam panels to fit the spaces and then covered that with a patriotic toile in a soft sepia color. I will hang various things on this back "wall" behind and above the dolls. For instance where I have a group of boy dolls playing with a large wooden toy cannon about 1875 vintage, I want a piece of old bunting or a faded silk flag or such. Am looking for that. I dont use much bright white, so want an ecru or tea dyed look.